Off line programming from math data assures dimensional accuracy. 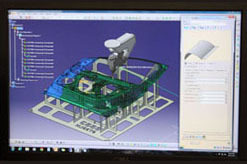 Fixtures are designed from CAD data and fabricated to provide cutting consistency. 3 and 5 axis CO2 Lasers have the capability to accommodate any requirement. CMM Inspection maintains project quality from beginning to end. Our dedicated staff and specialized attention ensures a quality product and service every time.